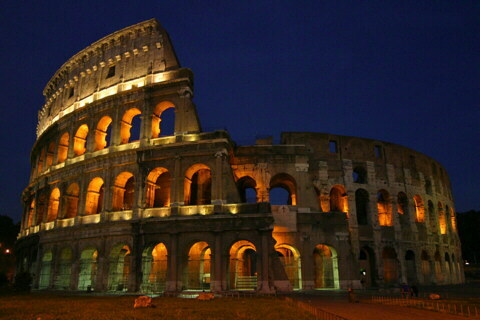 The Colosseum or Coliseum, also known as the Flavian Amphitheatre (Latin: Amphitheatrum Flavium; Italian: Anfiteatro Flavio or Colosseo) is an elliptical amphitheatre in the centre of the city of Rome, Italy. Built of concrete and stone,it was the largest amphitheatre of the Roman Empire, and is considered one of the greatest works of Roman architecture andengineering. It is the largest amphitheatre in the world. The Colosseum is situated just east of the Roman Forum. Construction began under the emperor Vespasian in 70 AD,and was completed in 80 AD under his successor and heir Titus. Further modifications were made during the reign of Domitian(81–96). These three emperors are known as the Flavian dynasty, and the amphitheatre was named in Latin for its association with their family name (Flavius). The Colosseum could hold, it is estimated, between 50,000 and 80,000 spectators,and was used for gladiatorialcontests and public spectacles such as mock sea battles, animal hunts, executions, re-enactments of famous battles, and dramas based on Classical mythology. The building ceased to be used for entertainment in the early medieval era. It was later reused for such purposes as housing, workshops, quarters for a religious order, a fortress, a quarry, and a Christian shrine.